The green shoots of spring appear to have sprung and it looks like we can, perhaps, finally bid farewell to the winter. Fingers crossed! Chief amongst these is a chance to visit the Roof Garden, perched on a roof in Kensington. I first visited this wonderful place way back in 1992, and even got to quaff a glass of champagne with some chap called Richard Branson. I wonder what happened to him? Another great suggestion for this month is the Forensic exhibition running at the Wellcome Museum in Euston. For my food and drink suggestion this month I've decided to, quite literally, go down the toilet! So, without further ado, here is my March list of ten things to do in London. Tuesday to Saturday 10am to 6pm (10pm on Thursdays) and Sundays 11am to 6pm. Closed on Mondays. If you are a fan of CSI, then this exhibition should be right up your alley, so to speak. It "explores the history, science and art of forensic medicine" and promises visitors a breathless journey from "crime scene to courtroom, across centuries and continents, exploring the specialisms of those involved in the delicate processes of collecting, analysing and presenting medical evidence." Phew, that was a mouth full! Once you've enjoyed (if that is the correct word in this case?) the exhibition you will come away with a fantastic understanding of Crime Scene Investigation and may even find yourself champing at the bit to put your newly acquired knowledge to work on solving some of history's greatest unsolved crimes. In which case, you might like to follow your visit by taking our guided tour around Jack the Ripper's London. This is one of London's loveliest churchyards and in the older of the two burial grounds, you will find the graves of the artist John Constable and John Harrison, of Longitude fame. But, it is a simple grave that is located in the overspill burial ground across the road that concerns us for the March list. To reach it, you'll need to go in through the gates and keep ahead towards the side wall of the red brick house opposite. However, pause by the line of graves one set in from it and you'll see the grave of the actor Anton Walbrook. To its left is the grave of Arthur and Sylvia Llewelyn Davies. Also buried here are their sons, who having been befriended by the author J.M. Barrie, inspired him to write his evergreen play Peter Pan, or The Boy Who wouldn't Grow Up in 1904. He publicly acknowledged that he had named the title character after Peter Llewelyn Davies, whose name is recorded on the flat stone over the grave. Peter would later develop an intense dislike at having his name associated with what he often referred to as "that terrible masterpiece." His later life was blighted by ill health and family tragedy and, on 5th April 1960, he jumped under a train at Sloane Square Station in Chelsea. Reporting on his death the newspapers referred to him in their headlines as "Peter Pan." Incidentally, Sylvia Llewelyn Davies was the aunt of the author Daphne Du Murier, whose father - and Sylvia's brother - Gerald is buried a few graves to the right (it is the wooden structure that looks like a set of stocks close to the fence) and who was the first actor to play the part of Captain Hook. For further details go visit The Attendant's website. Oh, the jokes I am tempted to attempt about this unusual venue, but I'll instead restrain myself and simply suggest that you enjoy London's most original location for a coffee bar: a Victorian gents toilet, no less, that dates from the 1890's. It is a truly unique venue that is not a part of one of the ubiquitous chains (oops) that you find all over London. The urinals themselves have been utilised to provide seating with small tables, and you'll find additional seating at the back. It's not the largest venue in London, in fact it doesn't even come close, so it does get very crowded at lunchtimes. But, hey ho, the experience of having drunk in a toilet should leave you flushed with pride. 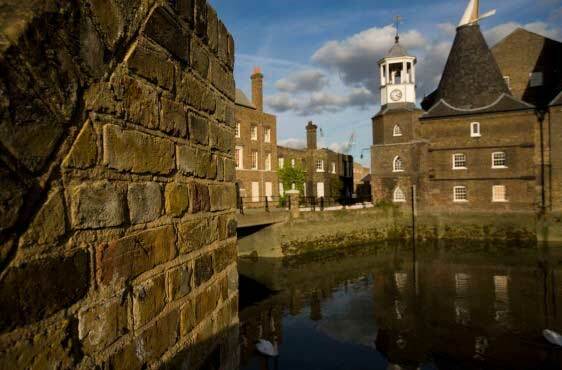 Situated out east, close to the Olympic Park, the Three Mills boasts London's oldest tidal Mill and is a true surprise, or at least it surprised me when I first paid this curious conservation area a visit in 2012. The centre-piece of the cluster of buildings that greet visitors today is the House Mill, a grade 1 listed building which has the distinction of being the World's largest existing tidal mill and which dates from 1776 and which occupies a picturesque riverside setting in the heart of London's East End. What with the surrounding canal side walks and the adjacent Three Mill Film Studios, you could easily spend an entire morning or afternoon here, and you really do feel that the 21st Century has been left far, far behind. To reach it, just come out of Bromley-By-Bow Station, head through the subway to the left of the station entrance and, once on the other side of the road, walk round to the car park of the Tesco store. Just past the Car Park, a footbridge takes you over a canal and suddenly you find yourself pitched back to the 18th and 19th centuries as you find surrounded by the aforementioned industrial buildings and canals. Admission Free, but donations requested. Further details on the BDA Museum Website. Have you ever taken your teeth, or anyone else's teeth for that matter, for granted? The fact is we tend to not give much thought to our teeth. Until, that is, something goes wrong and a trip to the dentist becomes a screaming necessity. But what did people do in the past? Well, fear not, because this curious little museum boasts an impressive collection of some 20,000 artefacts that tell the fascinating story of how dentistry evolved from being the domain of psychopathic marketplace hucksters into the gentle art that we all know and love today. The museum is packed full of treasures that will have you grimacing in pain, grimacing in pain or grimacing in pain as you survey everything from 19th century dental floss to clockwork drills that will have you grimacing in pain (have I said that already?). Seriously though, it's a fascinating museum about how people have looked after - or, in many cases, not looked after - their teeth for several hundred years. The Elfin Oak is a delightful piece of whimsy, that began life as an oak tree, 900 years ago. In 1928 the, by then, stump of the oak was moved from its original home in Richmond park and brought to Kensington Gardens where, over the next two years the illustrator Ivor Innes carved the figures of the "Little People" into it. The tree was a great favourite with the comedian Spike Milligan who, in 1966, led a successful campaign to have it restored, and, in 1997, its future was assured when it was declared a Grade 11 listed structure. The brightly coloured elves, gnomes and small animals that appear to live in its bark are a delight to discover. This one should have ewe flocking out onto the streets of London. From 28th March giant sculptures of Shaun the Sheep from Wallace and Grommit , all of which will be created by artists, celebrities and designers are to appear at iconic locations and beautiful green spaces all over London. Like the Paddington Bear statues that appeared last year, you will be able stand alongside them and get your photograph taken with another international superstar! Having done so you can bleat on about your experience to your heart's content. For further details go visit the official website. No under 14's and no cameras or mobile phones allowed inside the building. Admission Free but is on first come first serve basis, unless you are a defendant, in which case you get to jump the queue! For further details go to the Old Bailey Website. When it comes to criminal trials, the Old Bailey, or Central Criminal Court, to give it its correct title, is the biggie. Most of the trials are open to the public and thus you can sit up in the public galleries of the various rooms and look down on the proceedings in the wells of the courts below. Watching the barristers go about their business, badgering witnesses and defendants alike, can be a harrowing experience, but you come away determined to keep to the straight and narrow lest you end up on the receiving end of a similar tongue lashing from one of m'learned friends. A truly riveting, and occasionally, revolting, experience. For further details go to the Website. As you walk past the entrance of the stunning church of St Vedast alias Foster on Foster Lane, you pass a door that many people must pass on a daily basis and not give it a second thought. What a pity. Because those who hurry past are missing out on one of London's hidden gems. For, if you give the door a light push it will open and, stepping through it, the rush and the noise of modern London is left far behind and you find yourself in a delightful and secluded garden where peace and tranquility are the order of the day. Although it is not a place I would suggest making a special journey to visit, it is a place I would most certainly suggest stopping off at if you're in the City and are looking for somewhere to sit and chill for a few minutes, to rest your weary legs and recharge your energy levels. I hope you find the March list useful and that you get to enjoy at least some of the things that I have suggested. I'm really proud to announce the launch of a new Costumed Dickens Walking Tour, which I am doing in conjunction with the Charles Dickens Museum. It takes place on selected Wednesdays at 11am and 5pm and starts outside the museum at 48 Doughty Street. This means you can visit the house and then join the walk to visit some of the locations you will have heard about within. And I'll be dressed in Victorian costume to boot! This month I've put together a little film that shows the old alleyways at the historic heart of the City of London that were known to Charles Dickens. The film also features the wonderful George and Vulture, dating from 1600, and which was featured in Pickwick Papers.